Welcome to Dingz N Thingz! We remove those unsightly shopping cart dents, car door dings, hail damage as well as many "other" types of dents and dings that can happen every day.We would be happy to remove dents, dings, creases and hail damage to restore your car, truck, SUV, motorcycle, RV or even your refrigerator back to its new condition!! PDR is short for Paintless Dent Removal. The fine "art" of removing dents, dings, creases, hail damage and even larger dents from automobile sheet metal with the use of specialty designed tools. 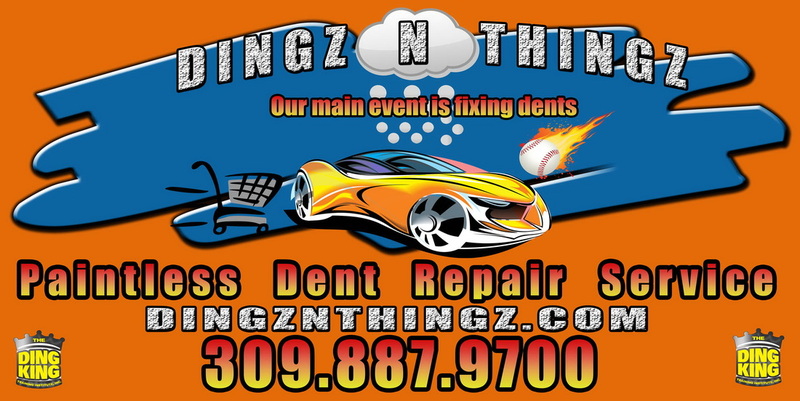 Dingz N Thingz utilizes proprietary for accessing dents without having to drill. After repairs are completed there will be no evidence a dent was ever there! Paintless Dent Repair is recognized by all major insurance companies and auto dealerships as the preferred method of repair for dents, dings, creases and hail damage. It is the auto body repair alternative. New and Used car dealerships, rental car agencies, fleet services and auto auctions use Paintless Dent Removal to remove dents, dings, creases and hail damage to increase the appearance and resale value of their inventory. Insurance companies rely on Paintless Dent Repair in cases of hail damage. They have found that our method of repair is very valuable to their clients. Saving time on repairs which equates to overall savings to their clients and to the insurance industry. Dingz N Thingz Mobile Service located in Albany, IL provides a solution that saves you time and money because we are more than happy to come to you!! We also know that in today’s world, you value your time more then ever. So do we, that is why we understand your need for reliable, quality work that can save you time as well as money. Run away carts are a vehicles worst nightmare! We repair fenders & gas tanks! Dingz N Thingz loves referrals, but then again, who doesn’t? They are the ultimate complement, and key for the success of any business. To show our appreciation we would like to offer you 15% off your next dent repair when someone mentions that you sent them our way! * 704 S Cherry Street * Albany, IL 61230 * 309-887-9700 * "OUR MAIN EVENT IS FIXING DENTS"